Every voter knows that feeling you get after you cast a ballot — that swell of pride, the uncontainable joy of slapping on an “I Voted” sticker and having everyone you pass notice that star-spangled icon of civic engagement. 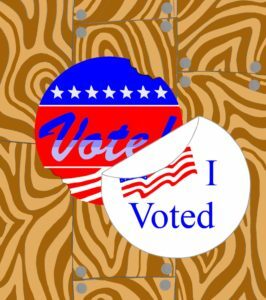 But when stickers aren’t incentive enough, alternative forms of voting and direct community action increase the likelihood that students turn out to vote. In anticipation of the midterm elections in November, UC Santa Cruz students and community organizers are encouraging everyone to get to the polls. To make voting as accessible as possible, the UCSC Office of Government and Community Relations has established a conditional polling location in Quarry Plaza. Provisional ballots allow people to register and vote at the same time, providing an option for people who forgot to register or who are unsure of where they are registered to cast their ballots. Provisional ballots are counted after election officials confirm the person’s registration and check that they haven’t already voted in another county. Voting by mail is another option available for people who can’t get to polling locations on Nov. 6. Voting by mail helps people with busy schedules, but to inspire people who feel disconnected from politics, Santa Cruz Indivisible and the UCSC Office of Government and Community Relations recommends talking about elections with peers. Deciding what, or who, to vote for can also be difficult for new voters. Ballot language is often dense and technical, which makes it difficult to unpack the nuances of arguments on different measures. It can also be hard to find sources that provide accessible and non-partisan information about issues on the ballot. Peer-to-peer discussions about proposed measures can alleviate the burden of doing research alone. Hiatt recalled being introduced to community organizing spaces like the SubRosa community space on Pacific Avenue and credits her friends for getting her invested in local elections. Now that she feels confident about voting, she offers her guidance to peers who see it as a hassle. She’ll talk through the ballot with them over dinner or coffee and help them see how easy voting can be. Even a short conversation can inspire someone to vote, which is why Santa Cruz Indivisible organized a team of almost 60 volunteers to go door to door talking to locals about voting in November. Conversations about voting help demystify the election process and hold everyone accountable to see voting as a civic responsibility rather than an inconvenient burden.